On Sunday afternoon 1/22 between 12:56 and 12:59 someone partially plowed our driveway. We don’t know who. At first we thought it was our regular plow guy, but we had left it with him to only plow if we called and gave him the OK, and this morning he confirmed that it was not him. After reviewing the video surveillance logs we discovered the plower had a pickup truck with a standard cab, full size bed and hydraulic plow blade with raised lighting. 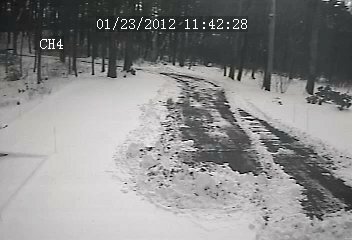 We have saved the videos of the plowing which involved 2 or 3 passes which only partially cleared the driveway. The incomplete plowing appears to have left a pile of snow in front of the garage door – the photo above is looking from the garage down the driveway. Best we can figure this is either a mistake or a neighbor with good intentions. If anyone has any other ideas please let us know! We don’t have any snow in Tallahassee, but if anyone wants to mow my weeds, feel free to do so..